Continuing with the strategy of being in your pocket anyway, the tech giant Microsoft is betting on a new approach: making Android and iOS work better together with Windows 10. 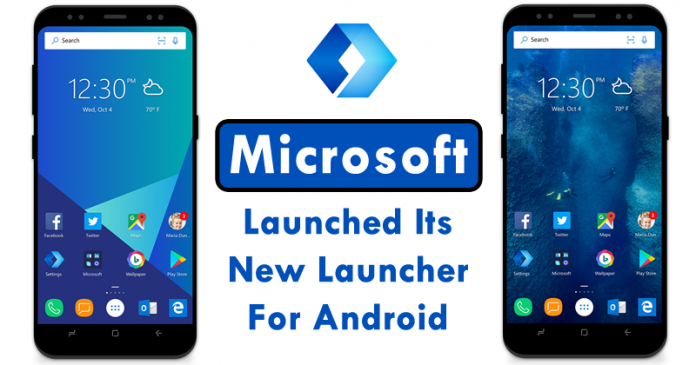 Hence, recently, the tech giant Microsoft has just launched its new launcher for Android that lets you connect your phone and PC. Continuing with the strategy of being in your pocket anyway, the tech giant Microsoft is betting on a new approach: making Android and iOS work better together with Windows 10. Hence, recently, the tech giant Microsoft has revamped its launcher for Android smartphones, of course, I am talking about the Arrow Launcher. The newly launched new version of the tech giant Microsoft’s Arrow launcher has now new features to stay more integrated with your Windows 10 computer and has changed its name to Microsoft Launcher. The launcher is very customizable and has a look according to the tech giant Microsoft’s Fluent Design, with several translucent elements and effects of movement and depth. In this new launcher, you can simply use your own wallpaper or you can make the tech giant’s Microsoft’s new Launcher, Microsoft Launcher download images automatically from Bing. On the left, you will find a utilization screen with your appointments, frequently asked questions, news, and documents. The application menu, by default, shows everything in alphabetical order and has vertical scrolling. From the home screen, you can slide your finger down and search for apps or search the web and not only that even you can choose Google if you do not like Bing. In addition, the new Microsoft Launcher lets you continue viewing your photos, editing Office 365 documents, or reading web pages (including Microsoft Edge) from your Android smartphone to your Windows 10 PC, in a scheme similar to iOS integration and macOS at Apple. The tech giant Microsoft’s new Launcher, of course, the new Microsoft Launcher is available for free and currently, it is in beta on Google Play. Whoever uses the Arrow Launcher will be automatically migrated to the new version.